President Trump has utilized controversy often in order to fundraise for his 2020 Presidential Campaign. Today, he and his campaign are at it yet again, with quite the unusual and outlandish request. 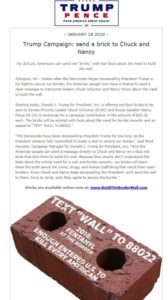 Weeks after the Demcrats began stonewalling President Trump in his fight to secure our border, the American people now have a chance to send a clear message to Democrat leaders chuck Schumer and Nancy Pelosi about the need to build a wall. It’ll be interesting to see if Chuck Schumer and Nancy Pelosi actually do receive these faux bricks, which have absolutely no use whatsoever.